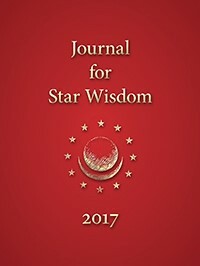 Journal for Star Wisdom 2017 includes articles of interest concerning star wisdom (Astrosophy), as well as a guide to the correspondences between stellar configurations during the life of Christ and those of today. This year’s journal begins with Robert Powell’s article on the Jupiter rhythm underlying Christ’s descent through the Earth’s subearthly spheres, opening the path to Shambhala, the new paradise. Next is an article by Estelle Isaacson on the Earth Mother indwelling the golden realm of Shambhala, the heart of Mother Earth. Claudia McLaren Lainson’s first article is “The Sun Chronicle in the Life of Jesus Christ,” followed by “The Sabbath Door: The Truth Shall Set Us Free.” Nicholas Kollerstrom contributed an article on the chart of the Resurrection of Jesus Christ—to which Robert Powell added an addendum. Julie Humphreys’ article is “Awaking to the Ideals of Truth,” taking fresh approaches to the theme of truth addressed by Claudia McLaren Lainson, whose third is “The Sphere of Mars and Gautama’s Heavenly Deed.” Estelle Isaacson’s second article, “The Archangel Michael and the Double of Humanity,” follows. Claudia McLaren Lainson contributed the article “Behold, We are to Make all Things New” to introduce her monthly commentaries for 2017.